Established in the year 1995, we, "CK Airtech India Private Limited", are an organization engaged in manufacturing, supplying and exporting a quality range of Industrial Equipment. Our product range include Centrifugal Blower, Bag House / Pulse Jet Filter, Cyclone Separator, Multi-cyclones, Wet & Dry Scrubber, Wet/Dry Spray Booth for Painting, Drying Ovens etc. Our offered products are developed at par with the set industry standards, these equipments are known for their excellent performance, easy installation and low maintenance. We exports in Middle East Countries. Based at Hosur, India, we have set-up advanced manufacturing plant, which is close to Bangalore Airport as well as to Chennai Seaport. The use of most latest and advanced technology enables us to execute all the challenging projects of our clients with excellence and adhering to market standards. Realizing our responsibility towards society, we have seen that global-warming threats are major issue that needs to be taken care off. 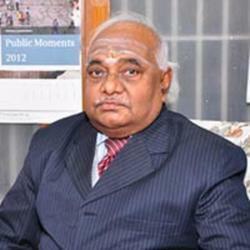 Under the guidance of "Mr. R Sakthi Mohan", we have been able to achieve such a remarkable place in the market. Our core strengths are Customization needs, competitive prices, on time delivery etc. Mr. N. Chandrasekaran a graduate in Mechanical Engineering has immense experience in Design and Product development. He has a Master’s degree from Indian Institute of Science on Aerodynamics which fuelled his passion to choose Design & Development as a career. 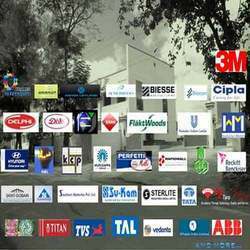 Had an experience to work with highly reputed organisations like L&T, BEML, Usha Telehoist (a Birla firm) with an industrial experience of more than 40 years. He questioned the energy efficiencies of Centrifugal Fans of reputed make and finally established his own range of Centrifugal fans in the market. Similarly he was involved in Energy audits of Air pollution Control systems in various process industries to optimise the energy used. Later when he conceptualized the idea of venturing into the field of Air pollution control equipment in the year 1995, CK Airtech was born with him as the founder Director. With a vision to build technological solutions to abate Air pollution in small and medium scale industries, he developed low cost solutions for challenging applications which lead to wide recognition for CK Airtech across different industrial verticals. 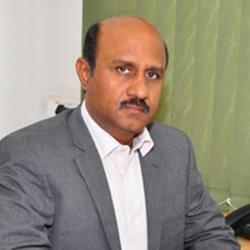 Mr. R. Sakthi Mohan Having graduated as a Mechanical Engineer he pursued few years as Marketing Executive in a Multinational followed by a career in Project management in an EPC supplying Power plants. Later migrated to Singapore for two years to work in Project management in the field of HVAC. Then with an urge to become an Entrepreneur he returned back to India. He was nurturing his dream for two years when he was employed at M/s.Titan Industries Ltd. as a Project management executive. During this period his acquaintance with Mr.Chandrasekaran inspired him to venture into Air Pollution Control business with a focus of serving small and medium scale industries. This culminated into becoming Founder Director of M/s. 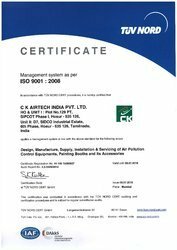 CK Airtech India Pvt. Ltd.
Over the ensuing years he has been the company’s guiding light with a strong vision and passion to build CK Airtech into a world class company with cutting edge technologies in the field of abating Air pollution with growing demand in all industry verticals. He is also instrumental in bringing in international expertise to associate with CK Airtech in the field of technology to offer competent solutions to Indian customers. As Managing Director, Sakthi Mohan maintains a hands-on involvement in this rapidly expanding enterprise with his team of spirited professionals. Mr. V. SaravananWith a degree in Mechanical engineering and more than 25 years of experience in the manufacturing industries, Saravanan brings a wealth of technical, practical and hands on expertise to manufacture equipments of custom built nature. He has very vast experience in Purchasing and Project management which makes him versatile in managing Projects on time and cost effective. He joined the company in 1999 as a shareholder and as Manufacturing Director and presently has a deep involvement in the overall management of the company. 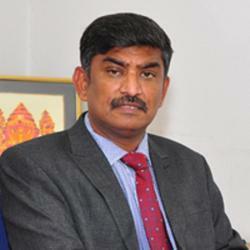 He is largely responsible for overseeing the execution of Projects from Design to Commissioning involving more than 40 Professionals at the company’s production facility in Hosur. We provide an example to the business and civic community by our ethical standards and mutual trust. We create a spirited, mutually supportive organization with integrity, flexibility and excellence. This results in employee dedication, enjoyment, fulfillment, personal growth and confidence, while maintaining a balance between a successful career and personal life. Compliance of our products & systems with stated norms. An array of customized applications to suit various dust / fumes generating processes is efficiently conceived and commissioned by us. The mechanism of extractions, type of treatment, dust disposal, and all the associated mechanisms are designed to suit the process, in full compliance with pollution control standards. We have proven results in successfully executing systems for a diverse range of industries, such as Automobile, Engineering / Foundry, Ceramics / Abrasives, Food Processing, Precision, Engineering / Electronic, Pharmaceutical / Bulk Drugs, Battery / Chemical industry. “A world-class Engineering Organization committed to fulfill environmental needs of different spectrum of industries”. “We use innovation to create and provide high-quality,energy efficient products and services that meet the needs of all industries at cost-effective prices. As a dynamic team we recognize change is essential to continue to satisfy our customers' needs”. Being a reputed organization, we ensure to manufacture and export unmatched quality range of products to our clients. Our Industrial Equipment is offered in customized forms to suit various dust / fumes generating processes. The equipment are also efficiently conceived and commissioned by us. All types of associated mechanisms are designed such as extractions, type of treatment, dust disposal, in tandem with the pollution control standards. Due to our skilled professionals and state-of-the-art infrastructure, we have been able to meet the precise needs of our clients in the most efficient manner. Ability to meet the bulk demands, moral business polices & customer centric approach, prompt delivery, complete transparency in all the business dealings and multiple modes of payment, have helped us in attaining a commendable position in this domain. Our experts effortlessly provide solutions for every kind of requirement with the appropriate selection of equipments, airflow requirements, filter media and other design parameters including duct design. We offer a whole range of comprehensive turnkey solutions that include initial survey, site assessment, design, manufacture, installation and commissioning gives the company that extra edge. Collaborating with eminent project consultants and engineering companies, we are able to ensure expert technical solutions and continuous improvements. Whatever the application requiring a custom built system, CK Airtech can give you the assurance of the best possible solution for every customer requirement. From concept through commissioning and manufacturing of equipment till after sales service, we cover the entire gamut of services to provide a one-stop solution for our clients' needs.